As you sort through many wedding entertainment options, it’s important to note that yes, there are in fact, many Colorado wedding DJ options for every bride’s individual taste, style and budget out there. That’s ok. Unlike the other companies, believe it or not, we really don’t want to book every wedding that inquires with us for their wedding. We realize that we may not be for every bride, nor is she for Amore DJ Entertainment. Rather, we love to book the “right fit” fun weddings and “team up” with our couples in a collaborative relationship to comprehensively plan each and every wedding making it spectacular, memorable and inserting a creative splash of, well, you! We all love what we do, and we want to have fun at weddings too! In the end, yes, we all play music (bands play live music, DJs play recorded music); yes, we all speak on a microphone; and yes, we all do our best to get guests dancing. However, results can vary greatly from company to company, DJ to DJ, DJ to band, band to band, couple to couple, venue to venue, family to family and even wedding to wedding. The difference for us? Amore’s Wedding Entertainment Design™ process of how we do those things, what we do behind the scenes to create, organize, meticulously prepare while simultaneously focusing on the big “why” we do what we do, the genuine passion, our philosophy and the many years of wedding experience we bring to the table. 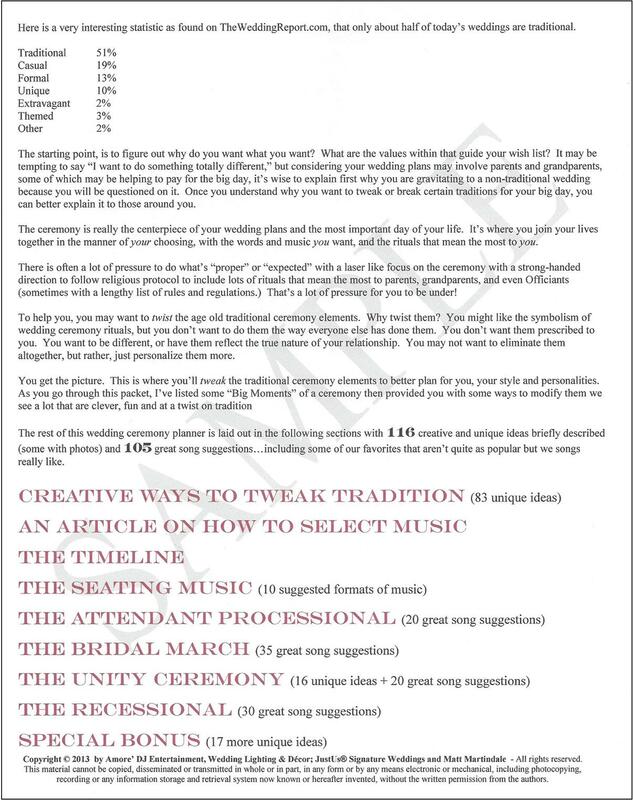 Our exclusive Wedding Entertainment Design™ process is specifically based on the planned and intentional discovery of you, your personalities, traditions, heritage, experiences, wedding day perceptions and expectations mirrored along side your wedding vision so we can help create a one-of-a-kind celebration. Then we are able to present suggestions based on our extensive wedding experience, creativity and knowledge to be able to do that. Together, we’ll create memorable and unique moments for the ceremony, and wedding reception using my extensive wedding experience to create meaningful and memorable moments, often times in areas or ways you may have never even considered. -We will simply chat for 55 to 60 minutes about the two of you, your vision, your tastes, your desired outcome, personal experiences, family traditions, heritage, etc. for your wedding. I will listen, ask questions and take copious notes. -Then, for about 15 minutes, we will chat about my background, our exclusive Wedding Entertainment Designer™ process, show you our wedding confirmation kit, and a couple of internal checklist. We’ll briefly chat about some of the 550 awesome and creative ideas I personally created this year for our weddings, and how our team of wedding and event experts can make your day unforgettable. 2) At our meeting, once I have an understanding of your vision for your wedding based on our discussion, I will provide you with an exact, “no surprises” price quote. -If, the quote is agreeable, we will mutually sign an entertainment contract with a 50% retainer paid then via check at that time. -If, for some reason the quote isn’t acceptable, we can discuss it and/or I will gladly offer my assistance in helping you find someone that better fits your budget. -If, for any reason, you or I feel we just don’t click, we can part paths knowing we shared some great ideas and you can keep the “Counting Down the Days to Your Wedding” guide. 3) Lastly, the remaining 15 minutes of our time together is specifically allocated for you to ask me anything. Often times, brides ask questions like, “Matt, you’ve personally performed over 1,300 weddings. What’s a cool way of doing ‘X’ (ie. the bouquet toss, or a creative alternative instead of a traditional cake, or ….?”). This is often my favorite part of an appointment because it’s a chance for brides to explore the creative “how” to make their wedding uniquely them. 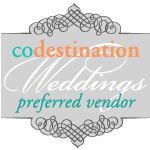 *We will discus the ideas that might fit into your style and taste for your wedding. *We will discuss your color(s), atmosphere (ambiance) lighting, focal point lighting, linens, highlight features and other décor. *We will discuss the room layout, head table, seating, room arrangement, cake location, and some of the logistical necessities (ie. room access, strike (tear down) time, electrical power needs, etc.) to create your specific wedding vision. *We will fully factor in all five senses when constructing the reception entertainment experience in the way only Amore’ DJ Entertainment can. 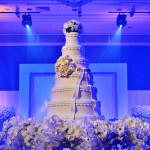 *Lastly, we promise to provide you the most comprehensive wedding confirmation and preparation process anywhere. For the most common packages booked, we do far more than a puny 2, 3, or even 7 page woefully lacking “planner” other DJs brag about. When we meet, you’ll see that our focus is beyond just playing music and making a few announcements like they do. We truly strive to help our couples in every way possible. This is why our weddings always go smooth and seamless. points) for you to review again. 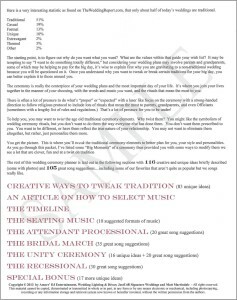 *Our exclusive “Signature Audio Tribute” guide (3 pages) that shows you how you can add this to accent your wedding day and make it even more memorable. *Access to my authentic creativity with over 550 original and unique wedding ideas created this last year! 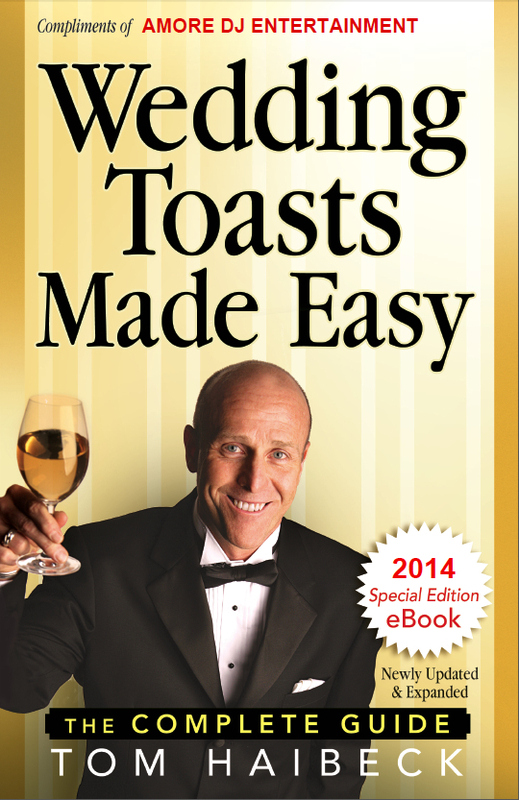 *We’ve licensed the eBook “Wedding Toasts Made Easy.” We send it directly to all those you have toasting. This easy to read, practical guide will help those speaking on your behalf to deliver a fantastic, meaningful and well delivered toast or speech! In fact, Regis, yes, that Regis Philbin from TV, used this same book for his very own daughter’s wedding. 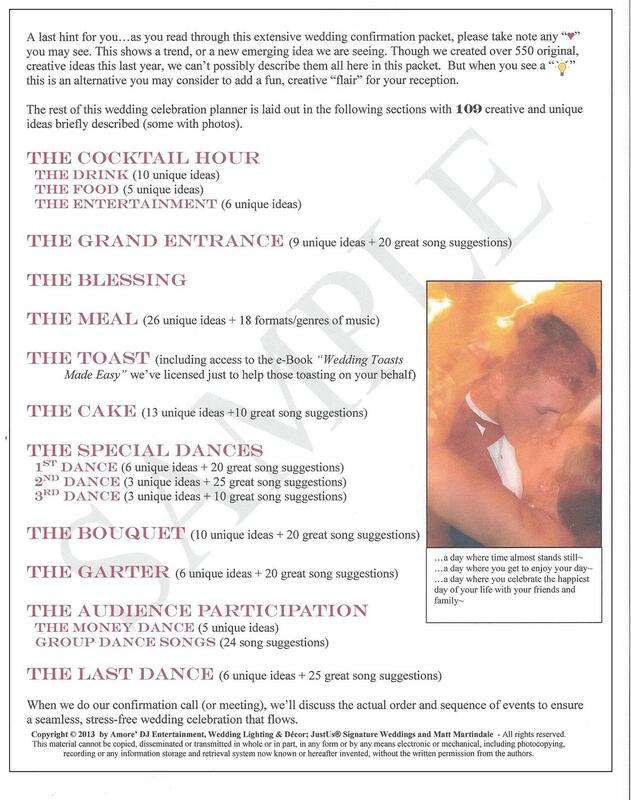 All you have to do, in the toast section of the reception kit, is just jot down the email addresses of those speaking, and we’ll take care of the rest. *Every other wedding professional is contacted personally by Matt the week of the wedding, and EVERY detail is reviewed so that we’re all on the same page. 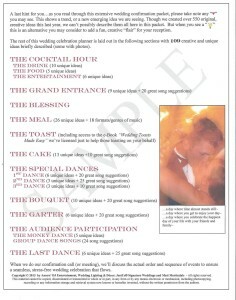 In fact, you’ll get a quick sneak peek of this final 4 to 6 week countdown process for out most common wedding packages! 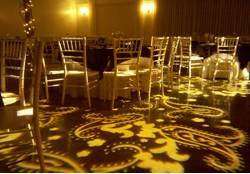 We make weddings elegant and stress-free! 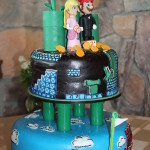 We make weddings amazingly fun!